ARE YOU FROM THE SOUTHEAST? Are you an undergraduate from the Southeast? Working class or job hunting? 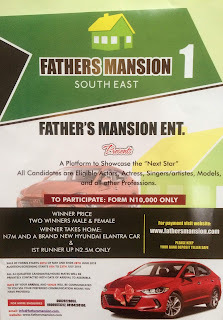 This is your opportunity to make your dream come through as the Father's mansion Enterprise limited brings to you, FATHER'S MANSION SEASON 1 (MAIDEN EDITION). A platform to showcase the next Star from the Southeast. We have decided to kick off this long term zonal project with it's maiden edition starting from the SOUTHEAST zone of Nigeria. Only citizens from the SOUTH EAST ZONE of Nigeria are Eligible to participate in this maiden edition. Subsequent Father's Mansion Reality Tv Shows will come up shortly in the SOUTH SOUTH, WEST and NORTHERN REGIONS of Nigeria. Are you Creative, talented and have what it takes to be a Celebrity? 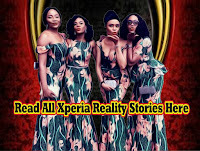 Are you from the south east and you want to be seen, you want to be known, you want to be a star, you want your talent and brand to be unveiled, recognized and harvested? Your time is now. Nigerians will watch you live your life for 8 weeks on Tv. WINNER PRICE - 7 Million Naira cash and a brand new car. 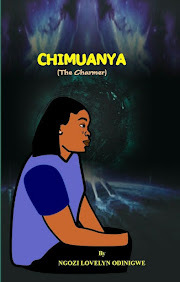 1ST RUNNER UP - 2,500,000 million Naira. Other house mates will take home mouth watering cash prizes at the end of the show. 24 housemates will get into the Father's Mansion House and a total of 12 housemates will be evicted on the last day (Sunday) of the first week of the show, leaving the remaining 12 housemates to battle it out until the last day of the show. The first 12 evicted house mates will take home cash prizes. Sale of form starts 28 OF MAY 2018 AND ENDS 28 OF JUNE 2018. AUDITION/SCREENING STARTS 9TH JULY TO 23RD JULY 2018. Tv Show starts Airing on the First week of August 2018. 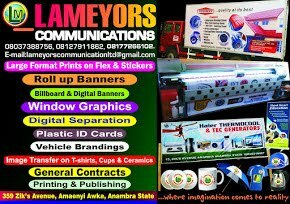 For more inquiries and sponsorship contact the Tel - 08069573312, 09026228653, 08184208190.